For over 25 years, we’ve been designing a better way to cook outdoors. Over all this time, we’ve made a huge variety of outdoor cooking gear. But our staple product from the start has been our propane camp stoves. Obviously, their rugged, durable design has a lot to do with their popularity; other features like powerful burners, removable legs, and matchless ignition have also had a hand in keeping our classic stoves at the top of the industry. However, there is one thing about our stoves that truly steals the show: they aren’t stoves. Okay, so they are stoves in the literal sense. But they aren’t just stoves. 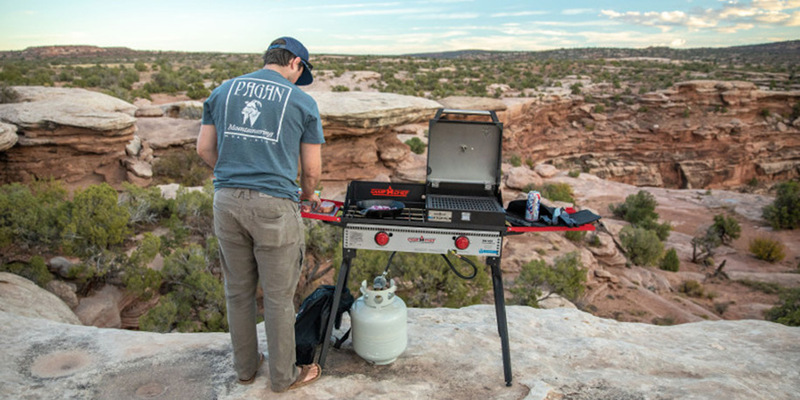 We created the cook system to fulfill all of your outdoor cooking needs. Our armada of accessories alongside each of our stoves makes it so that you can enjoy all your favorite meals outdoors just as easily as you enjoy them indoors—all one cooker. How does that work? Let us explain. 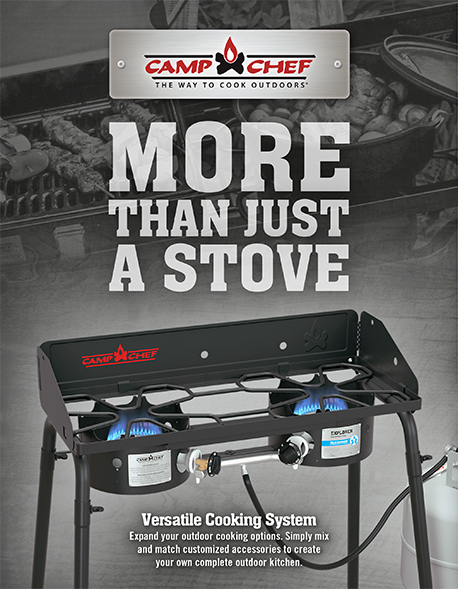 At Camp Chef, we have two separate cooking systems: 14-inch and 16-inch. You will often see these numbers on our stoves and accessories to show you to which system each product belongs. The measurements refer to the depth of the stove (front to back). Our 14-inch system includes mainly two-burner stoves and accessories with a 14-inch depth; our 16-inch system includes mainly three-burner stoves and accessories with a 16-inch depth. Starting to make sense? Now, why the different systems? One of our priorities at Camp Chef is offering you a better way to cook where and what you want, for however many people you have in your group. Some outdoor chefs like to keep things simple with two burners and two accessories, or a single large accessory. On the other hand, many others love having a third burner for an extra accessory to open up their cooking options. After you’ve decided on the size of your system, it’s time to add your choice of stove accessories. To give you the freedom to cook what you want, we offer a variety of accessories, including BBQ boxes, outdoor ovens, griddles, Dutch ovens, skillets, and more. Our professional grill boxes are awesome for grilling veggies, kabobs, burgers, brats, and more. They feature cast iron grill grates, so you can even sear your meat. 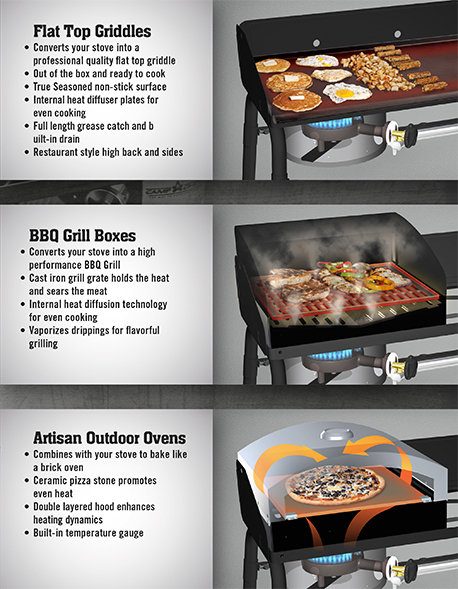 As you might expect, our outdoor ovens are perfect for baking pizza wherever you go. However, you can also bake cookies, brownies, open-faced sandwiches, and even meat. Our griddles come pre-seasoned, so they’re ready to cook as soon as you are. They are among the most versatile of cooking accessories. You can make bacon, stir fry, eggs, pancakes, burgers, and more all on one surface. Dutch ovens and skillets—or any of our other cast iron accessories—are the Swiss army knife of your stovetop accessories. They can do so much. Baking, frying, searing…the list goes on. All of our cast iron pieces are pre-seasoned, so there’s no hassle after you take it out of the box. By mixing and matching all of these products, there is almost no limit to what you can make for breakfast, lunch, or dinner. Seriously. Imagine bacon and eggs in the morning, pizza at lunch, and philly cheese steak sandwiches for dinner—all from a single stove. That’s what our cook systems are all about. With so much cooking power and flexibility, you can cook what you love to eat no matter where you are. We’ve compiled a small list of our top recipe picks, all of which you can make using you 14-inch or 16-inch system. If you have other ideas, let us know in the comments. • Spicy Grilled Shrimp Kabobs • Chocolate Pumpkin Skillet Brownies • Stuffed Venison Backstrap • Finger-Lickin’ Fried Chicken • Pina Colada Burger • Deep Fried Oreos • Artisan Margherita Pizza You’ve got the information, you’ve got the recipes, now get out there and start cooking. Choose your dream cook system today.